This project was a partnership between Mackie Research and Transport Engineering Research New Zealand (TERNZ). The Ashburton School Bus Trial, completed in May 2013 to April 2014 was developed to reduce vehicle speeds near school buses that were picking up or dropping off children. 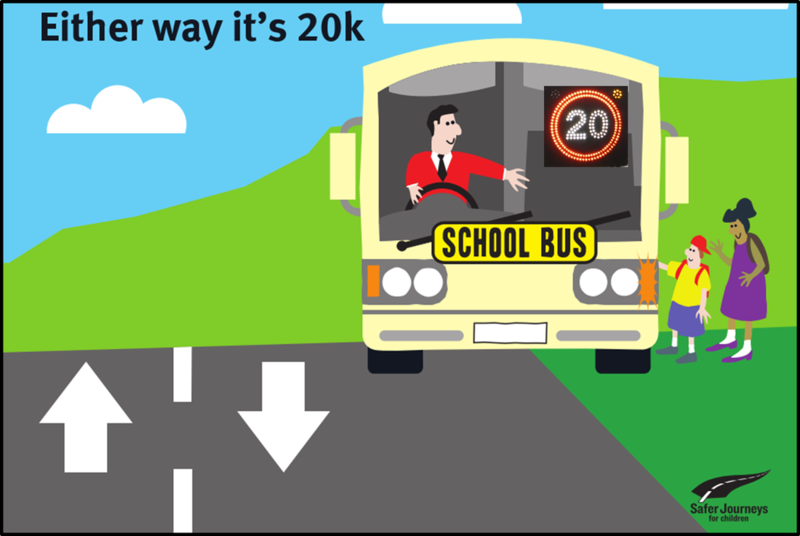 The trial aimed to improve driver knowledge of the 20km/hr speed limit past school buses and increase situational awareness. Driver pre-post perception surveys showed an increase in driver knowledge of the 20km/hr speed limit and an increase in self-reported compliance with this limit. There were substantial decreases in mean and modal speeds past school buses in both 100km/hr and 50km/hr areas. 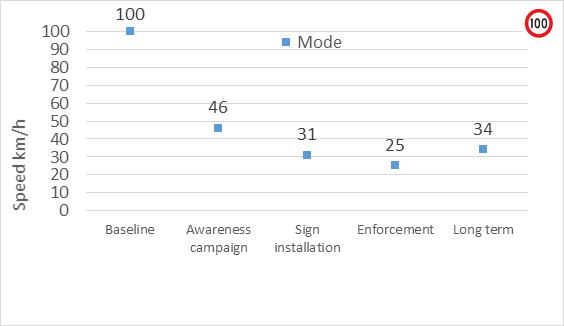 The LED signs on the school buses had the largest impact on speed, and police enforcement (stage 3) helped to further reduce and maintain these speed reductions (Figure 1). Overall the trial has shown that this combination approach is feasible and helps to maximise speed outcomes. The potential benefits in terms of child deaths and serious injuries outweigh the financial costs of the approach. The Ashburton School Bus Trial was delivered with the support of The Ashburton Community and Schools, NZTA, NZ Police, Pearson Coachlines, Rural Women NZ and the Ashburton District Council.